Beautiful issued and uncancelled certificate from Germany issued in 1924. 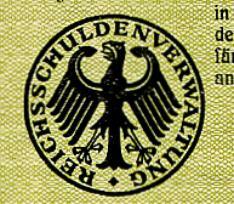 This bond was a 8-15 zinsige Schatzanweisung des Deutschen Reichs uber 1000000000 Marks. This historic document has an ornate border around it with vignettes of German Eagle. This item has the printed signatures of the government officials and is over 93 years old. 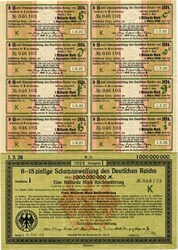 The notes issued by the German Government in 1924 paid interest every six months at a variable rate, which was linked to the average official discount rate during the first four months of each coupon period. In addition, the rate of interest was guaranteed not to fall below a floor of eight percent, and was capped at fifteen percent.